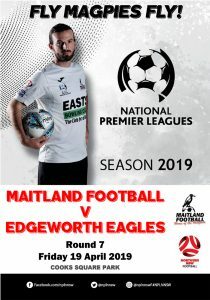 A warm welcome today to Cooks Square Park to the families and supporters of both Maitland FC and the Edgeworth Eagles for what should be our third but will only be our first NPL home game for 2019 following two rain events! We are very proud of the condition of the playing field surface here at Cooks Square Park, the underground irrigation installed by Maitland City Council in 2017 has been a game changer for CSP. As a result of our success with the NSW Asian Cup 2015 Legacy Fund, some well overdue infrastructure works have been completed. The new perimeter fence and player shelters have changed the look of the park and with additional seating and shelter, Cooks Square is much better prepared for some quality NPL football.